Before we dive into the Electronic Shares, we would like to make sure you understand all principles. You are not obligated to issue Shares Certificates in Paper or Digital Certificates (some of you might prefer to issue the more accepted digital versions [also known as PDF Shares Certificates] which is also well recognized). All your shares can be issued electronically into the ledger by recording them as data entry or you can use an app such as EQVISTA. This article will help you to understand the principles of issuing shares and to put your knowledge into practice. Once you set up a company, you get all kinds of documents to fill out and submit. The first and most important part is to appoint a director and issue shares to shareholders. You appoint the director by preparing the Resolution of Directors and after which shareholders receive company shares. Some states will require you to file this appointment and shareholders structure directly with the state. 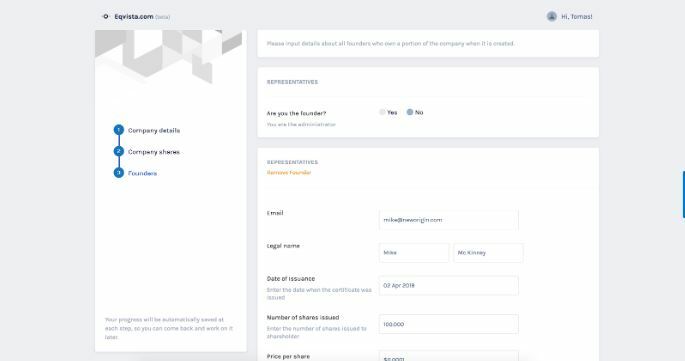 You can issue shares by distributing Shares Certificates and recording them on the Register of Members (also known as Register of Shareholders). The Register of Members keeps records of the shares movements and other important details. 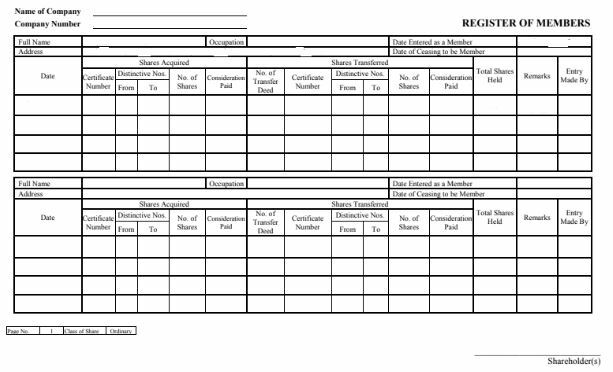 Your Register of Members is your primary record of who holds shares in your company. It is a requirement that you keep your Register of Members up to date. Most of the companies keep the data in Excel file as a ledger or in Word document. Startups are usually issuing their stock digitally (in pdf format) rather than on paper stock certificates. 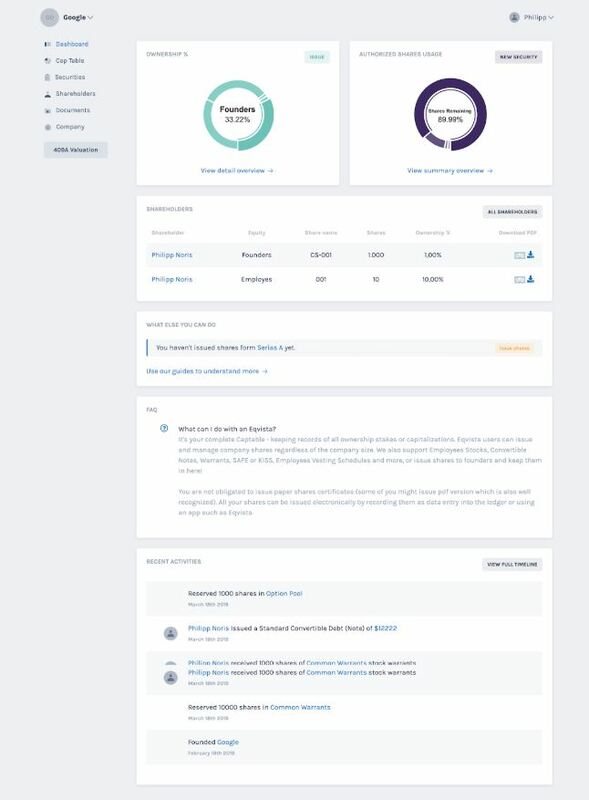 This is the share certificate you might issue or receive – Paper shares are printed and received physically, Digital or Electronic shares certificates are received by email in PDF format. EQVISTA supports both certificated and uncertificated (book entry) shares. Below is an electronic shares entry on EQVISTA which replaces both Share Certificates and Register of Members. 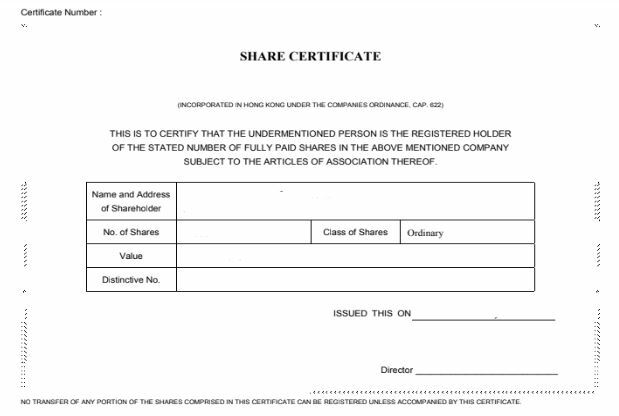 These shares are issued without a certificate – see above Paper share, the Digital or Electronic share certificate. Even though public companies have been issuing uncertificated shares for decades, the current trend is to completely eliminate any paper certificates. This is an uncertified (electronic share) share recorded on EQVISTA App. It’s always electronic. There is no physical evidence. Electronic shares are well recognized by most states. This is one of the ways to record your company shares. You simply input the data on Excel and share it with the shareholders. Since the Excel doesn’t have many functions and variables, it is better to use as an app which is designed to handle your electronic stocks. Register of Members is a form for recording shareholders – If you issue company shares, the Register of Members is also known as the Register of Shareholders. The latter records essential details of individuals who own the company as well as the shares status and the details of the shares they hold. Captable is a spreadsheet that lists all of the securities of a company, along with who owns them. You will be most likely seeing it as the above. Digital (or electronic) certificates are Certificated Shares just like paper certificates. You can issue them through a online platform as EQVISTA (just make sure that a platform of your choice has an exporting data function). There are several scenarios. 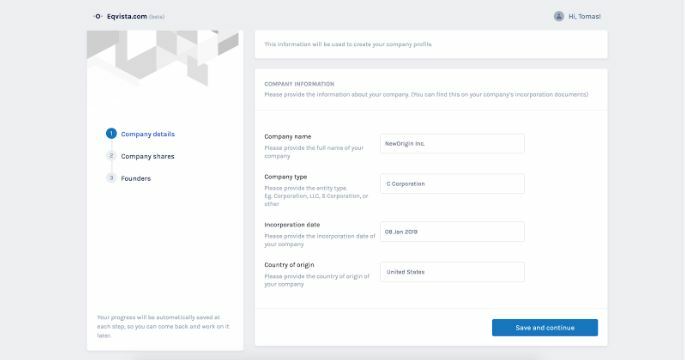 Your company is already set up and you have issued shares. The PDF is stored somewhere in your computer or on a local server. This is an option for any of the current company single owners, but if the company is getting bigger, you will need alternate solutions to record shares. The certificate is digitally signed. As your company grows you need increasingly more sophisticated way of keeping your records in order. You can use EQVISTA and start issuing electronic shares for the rest of the founders, employees or investors. Our app supports both pdf or paper share certificates (certificated) plus electronic shares (uncertificated (book entry)). It is ok to keep both shares, but remember that it’s always better to start recording your shares immediately on any available online app which also supports captable. You can also ask your lawyer to help you collect all certificated shares and cancel them. Once you have all certificated shares, you might reissue new certificates to stakeholders. As mentioned above, you might simply keep the old shares certificates and start issuing electronic shares. As you know, we support both. We did client onboarding so you can get your company shares distribution to the shareholders in the matter of minutes. Here you fill out the company details. We would ask you for the number of authorized shares & par value share. We presume that you start with onboarding founders. You can add other members once you finish the onboarding. Well done! You are ready to onboard more shareholders, prepare ESO or simply issue preferred shares to investors. It is a pretty comprehensive app. We simply help you to issue and manage your company shares. There is also more you can do. 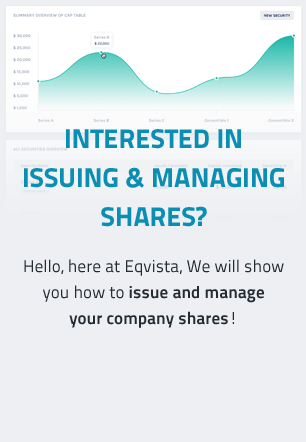 EQVISTA users can issue and manage company shares regardless of the company size. 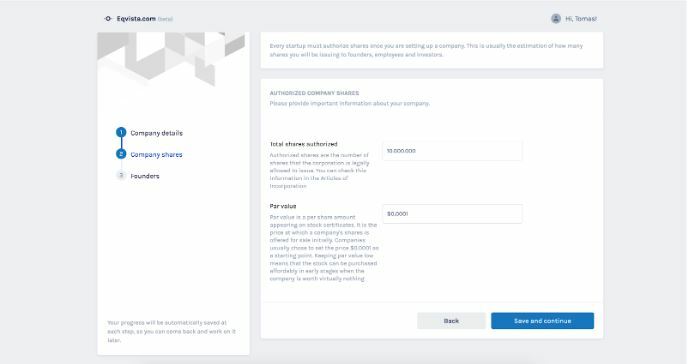 We also support Employees Stocks, Convertible Notes, Warrants, SAFE or KISS, Employees Vesting Schedules and more, or issue shares to founders and keep them in here! You are not obligated to issue paper shares certificates (some of you might issue pdf version which is also well recognized). All your shares can be issued electronically by recording them as data entry into the ledger or using an app such as EQVISTA. We have also implemented exit function for you if you’re not happy with our platform. You can simply export all data to Excel file and use another platform or keep using Excel file instead. If you have any suggestions on how we can improve our services, please do let us know.